Why does space between top front teeth keep opening up after orthodontic treatment? Probably one of the most noticeable malocclusions in people with otherwise straight teeth is that of spacing between upper incisors. In fact, there usually is fairly good alignment of the upper teeth in these cases so many times patients and parents think this is an easy fix. Many may even try to close space with an upper clear aligner or upper braces alone only to find the space(s) return soon after closure. Space in the upper front teeth as an adolescent (after the upper cuspids have erupted) when there is no space in the lower can be a sign of heavy occlusion of the front teeth which in turn holds or pushed the upper front teeth outward; as the arch circumference increases (but the tooth sizes remain constant), the patient experiences gaps, usually between upper central incisors and lateral incisors. It can be gradual or even develop as the patient transitions from baby teeth to permanent teeth. If the patient is waiting on upper canines to erupt, the space may close when these canines fully erupt. If the space is present after canines erupt, then there is usually a problem. Over time, heavy contact can lead to excessive wear of the teeth, mobility or even recession. Over time, the heavy contact on font teeth caused the enamel to wear down as the lower teeth continued to drive upward into the wearing teeth more and more; once into the softer inner dentin, the wear accelerated. This heavy contact can be from excessive growth of the lower jaw forward (which brings lower teeth forward essentially “jamming” them into the back of upper incisors), upper front teeth leaning backward (termed “Division II”) or can from smaller than average upper teeth. 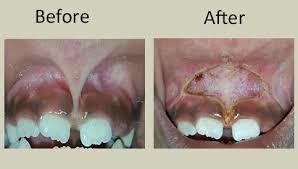 In rare occasions there can be an extra tooth under the gums which must be removed. The sequence of eruptions and the timing of the lower jaw growth can also lead to a deepbite (early over-eruption of lower incisors) which also can cause heavy contact and spacing. 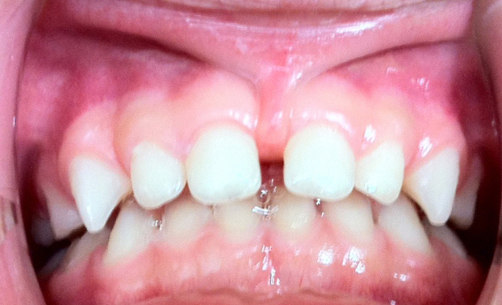 Extra tooth in the upper midline (termed a “mesiodens”) not allowing upper central incisors to move together. These extra teeth must be removed (I prefer to remove them before treatment if there is already space for access). Deepbite with premature contact on upper incisors. 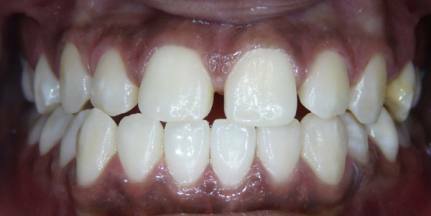 This patient also presents with congenitally small lateral incisors making the space even larger between from teeth. Following treatment with braces, spaces between front teeth are closed, the deepbite is corrected and the small lateral incisors have been built up with white “composite” material. 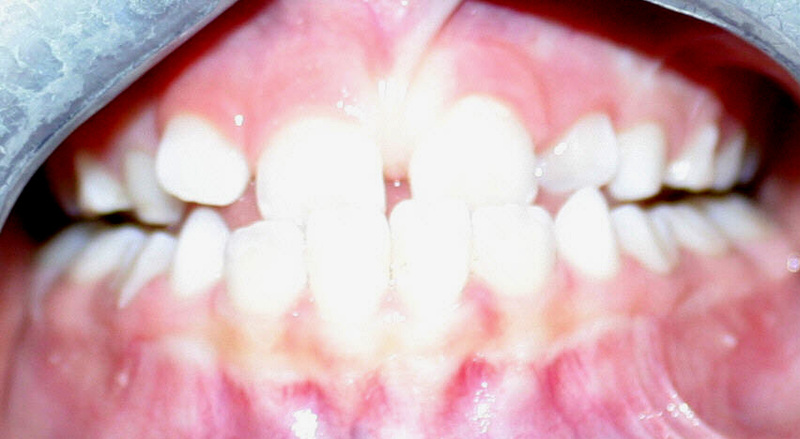 Sometimes the upper front teeth grow in and lean away from each other making the appearance of a large gap (see patient below); there may be contact but is hidden under the gumline. In these cases, the teeth must be uprighted so that they lean back toward each other, this brings the contact point from below the neckline (below the gums) up to the top 1/3 of each tooth which can completely close the space. This is something I see left in cases after treatment as patients come in with retainers “that won’t close the space” from other offices. I have to explain to these patients that the teeth ARE in contact but it is below the gumline; to “close” the visible space we have to attach brackets to the teeth and tip them back toward each other as we shift the roots away from each other. No retainer can close space when the teeth are leaning away from each other and already in contact below the gumline. Patient previously treated with relapse due to divergent upper incisors; corrected by tipping the crowns of the teeth toward the midline while moving roots away from the midline. There was no treatment in the lower arch in this case as most of the upper space was secondary to poor root position. So how can we fix the spacing and keep it closed? If upper incisors are leaning backward then these upper front teeth must be uprighted first; this is a different type of case and is covered in other articles due to the unique complications of that malocclusion. Upper front teeth leaning backward with lower front teeth over-erupted. To close this space, the upper teeth must be “pushed” back up and the lower incisors “pushed” down as we also pivot the upper front teeth forward (see below). Same patient after correcting front teeth, notice the space closes easily once the occlusion allows the teeth to bite normally. But if the front teeth are not leaning backward (Orthodontists use a cephalometric or side-view X-Ray to determine and quantify this angle) then the answer is we must focus on the lower teeth first. In almost EVERY case of heavy incisor contact and spacing in the upper arch, the first step is to pull lower front teeth back, away from the upper front teeth. Once pulled back and there is room for upper teeth to also be brought back, then the upper space between incisors can be closed and held. Patients should be given a couple of months at the end (before removing appliances) to allow the lower jaw to shift or “settle” because it may have been pushed back and held back by the patient subconsciously so that once it gains the freedom to move, it may come forward bringing the lower teeth forward back into contact; this requires more retraction of the lower teeth or the space will return. If lower jaw growth is significant enough, and the patient young enough, we may consider bringing the upper jaw forward (see my article on when to treat underbites). 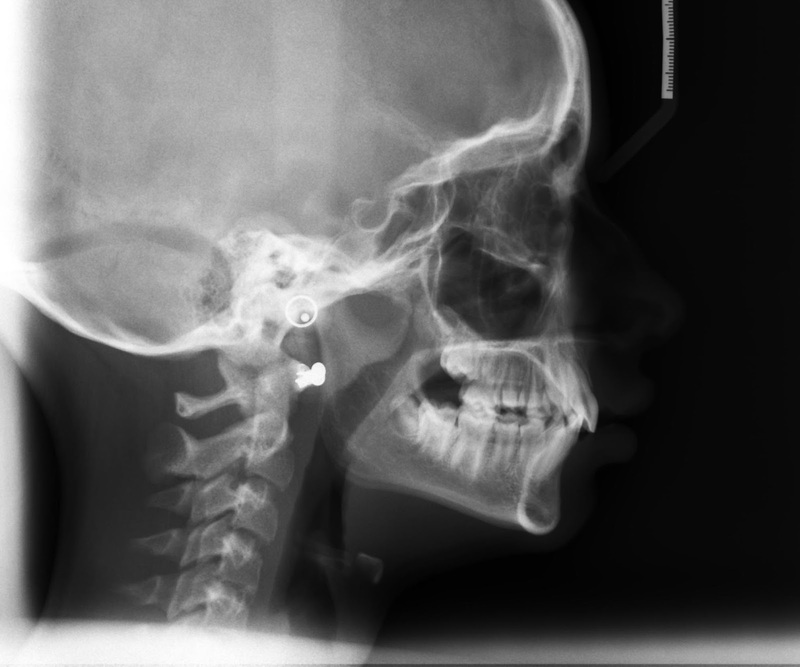 This 7 year old patient presented with an early developing underbite; correction required pulling the entire upper jaw forward with protraction headgear (see blog on when to fix underbites). At 12 years old, following correction of the underbite from age 7 to 8, the patient no longer has space or heavy contact on front teeth. In fact, no further treatment was needed or recommended. Growth later in life can increase space that used to be minimal; the patient below is an example of exceptional lower jaw growth that was not corrected early as in the above patient. This patient’s lower jaw has grown forward beyond the ability to simply reposition teeth; here, as an adult patient, we must either remove teeth and close space or even shift the entire lower jaw back with surgery before being able to close space in the upper arch. Finally, once the lower teeth are pulled back (and aligned) and upper space closed and held to allow time for the lower jaw to shift, then retainers must be placed and monitored closely for the next 6 to 12mo to check for any heavy contact returning on individual teeth. If a single tooth is still mobile 3mo following braces, you can safely assume heavy contact and relapse of space; this tooth should be marked with articulating paper (typewriter ribbon for us older folks) and adjusted with judicial polishing of the enamel in the offending spot(s). If the patient can tap/bite on their back teeth and feel no movement in the upper front teeth, they are safe to go back to regular retainer wear. But this should be checked regularly over the first year (and even further depending on the patient’s age and growth pattern) if you expect to keep the spaces closed. 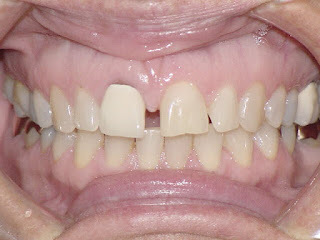 “I have heard that the gums between front teeth must be cut to close the space,” what about this? In the past, cutting the gum tissue between teeth with large space in the midline (frenectomy) was sometimes performed if the attachment of the lip was high and between the teeth (similar to being tongue-tied in the lower arch). When this attachment is the problem, it is very deep and will require an oral surgeon to separate the tissue all the way to the bone (See picture below). Unfortunately this is almost never done completely during “typical” frenectomies. In truth, the tissue between two front teeth that have a gap is usually just filling the space because the space is already there; it is not normally the cause of the space. These pictures illustrate a before and after frenectomy due to attachment of the frenum directly between the front central incisors. Does that mean patients never need a frenectomy? No. Sometimes the gap has been present so long that when the teeth are brought together, the tissue “bunches up” and becomes chronically inflamed. In these cases, the excess soft tissue can be removed following space closure using a laser with minimal discomfort and quick healing. My doctor wants everyone to have a laser frenectomy, is that wrong? A good case from relieving the tissue that connect the lip to the gums (frenum or frenulum); if left to during development, this thick tissue will hold front teeth apart. I believe there is a trend in offices that get lasers to be more aggressive in prescribing laser frenectomies. There is some logic in reducing this tissue in some cases (see above) but until lasers, we just rarely sent out frenectomies for anything less than the most significant space. I have seen no evidence that routine laser frenectomies are effective in most cases of spacing but I will continue to monitor the journals for a juried study to come out. I will say that the sales people that market these soft-tissue lasers certainly stress the profitability based on X percentage of patients getting laser frenectomies every week which makes me a little wary if not somewhat nauseous. This photo (borrowed from the Internet) shows a “successful” frenectomy that has healed nicely but you can see there is no effect on the initial spacing from removal of the frenum. I do like the lasers for more surface-based frenectomies, they are faster than the scalpel and have less side effects/bleeding/discomfort, but I have seen early recession in one case so for now and as I mentioned previously, true cases of frenum attachment goes to the bone which requires actual surgery and not just a surface release of soft tissue. So I am personally reserving referrals of my patients to really obvious and significant cases only. And I rarely refer until the space is closed to prevent scar tissue from building which may actually make space closure more difficult. Laser fenectomy. As you can imagine, this really should not be a routine service if not necessary. What about just placing a permanent or “fixed” retainer on the upper teeth? Sometimes you will hear of a friend or Internet buddy telling you a wire was bonded behind front teeth to hold space closed. This is NOT the accurate way to keep space closed; although a wire may keep space closed, it may also leave the front teeth in heavy contact and cause sever wear, long-term mobility of teeth, enhanced periodontal bone loss or even lead to mild TMD (jaw pain). It is a band aid and not a fix. Now if a wire is bonded AND the bite monitored and adjusted for any heavy contact than that can be acceptable BUT in a good bite, there really usually is no room to bond a wire behind the upper teeth without causing heavy contact with lower teeth. Also, bonded retainers hold plaque and can lead to decay and enhanced periodontal disease if not taken care of with ideal oral hygiene. 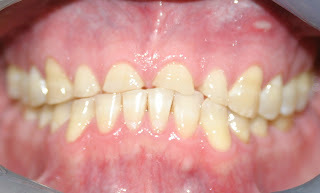 A bonded upper “retainer” behind front teeth; this makes cleaning very difficult and can cause heavy/premature occlusion with the lower teeth which can push the entire segment of upper teeth forward or lead to excessive wear in the lower teeth. It can even push the lower jaw back. 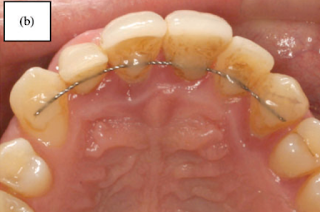 This retainer is in contact which is causing lower teeth to push the entire segment held by the wire forward. A similar case where the fixed “retainer” held space closed at the midline but allowed lower teeth to push the entire segment forward (note the space on the left side). You can also see the gingival margin inflamed. Seek out a competent and establish Orthodontist that offers traditional braces and can show you before and after pictures years after treatment. Space in the upper front teeth can only be properly closed (and held closed afterward) if the reason for the space is identified and corrected. Just like any other field, there are doctors and there are really good doctors, it is up to you to find good advice and not just find someone who will tell you what they think you want to hear. In this particular scenario, there is usually one right way and lots of wrong ways to close space; many will lead to relapse but good treatment with good retention will give you a life-long smile. 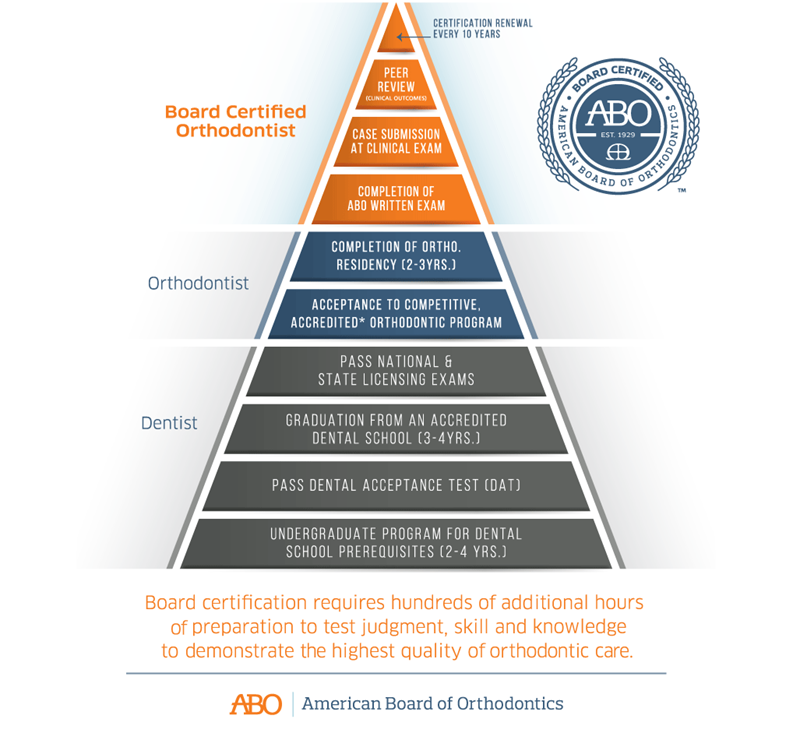 The most expensive orthodontics is that which has to be done twice (or more). Same patient 2 ½ years AFTER removal of braces showing good stability. 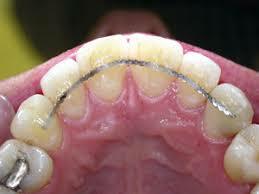 Retainers were discontinued at 18mo after 6mo of full time wear and 12months of nighttime wear. 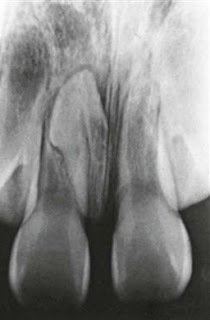 Adult with spacing her entire life which led to fracture of a front tooth. Correction with braces included retraction of the lower teeth followed by space closure in the upper arch. After space closure a new crown was fabricated for esthetics. 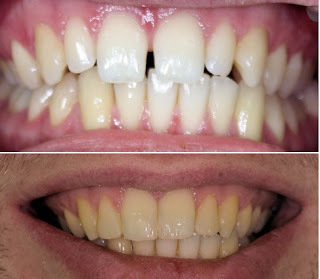 This photo was taken a full 3 years after removal of braces and the space has remained closed; regular visits were used to monitor for any heavy contact on front teeth. Dr. James R. Waters is a 1996 graduate from UTHSC Dental School in San Antonio, 1997 graduate of Advanced Dentistry from the UNMC in Nebraska and the 2001 Valedictorian graduate from the prestigious Saint Louis University Orthodontic Program receiving the J.P. Marshall award for clinical excellence in 2001. He holds a Bachelor’s Degree in Science, Doctorate in Dental Surgery, a post-doctorate certificate in Advanced Dentistry, post-doctorate Degree in Orthodontics & Dentofacial Orthopedics and a Master of Science Degree in Orthodontics and is a Diplomate of the American Board of Orthodontics. Dr. Waters and his wife of 22 years live in Austin, TX with their 4 children where he has a thriving, multi-faceted Specialist practice with locations in Steiner Ranch and North-Central Austin. You can learn more about Dr. Waters at BracesAustin.com.